Over at monachos.net, there's an entire thread on non-canonical icons. I'll post some of the pictures later. Just goes to show that Orthodox artists make mistakes, too. There are several threads at monachos.net on non-canonical icons. They are very useful, detailed and instructive. This is somehow supposed to be the Trinity. I think. This is 'Holy Silence.' Not exactly sure why it copies some elements of the Virgin of the Sign. 'Angel Countenance.' 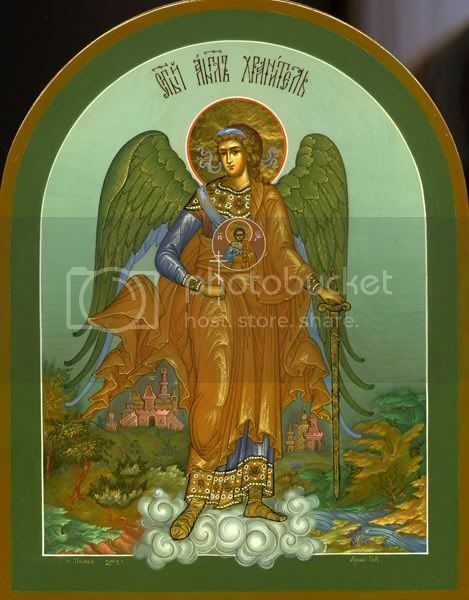 Angels are normally depicted as male. 'Angel of the Sign.' With all respect, an angel did not give birth to Jesus. There were weirder ones. I would like to see a book on unusual icons, if only to show us what is not allowed and what is. The first one must have been done by MC Escher. It looks like God sneezed. I like that in the way it elaborates on the truly symobolic nature of religious imagery. I was discussing of all things the merits of Egyptian icongraphy of strange and mismatched animal-men which some folks have said are representations of the Reptilian shape-shifting aliens as part of the said conspiracy. 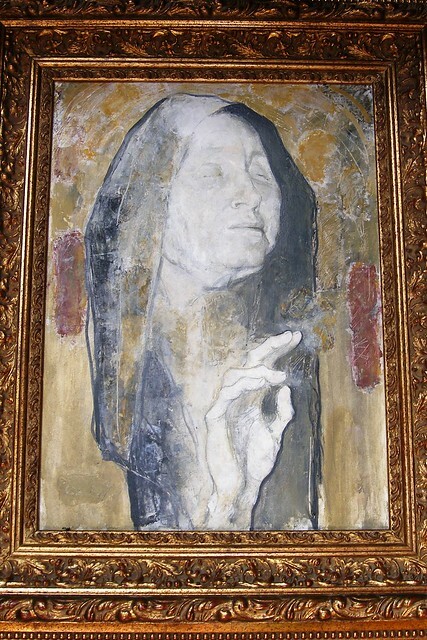 I had to explain that religious imagery is not meant to be taken literal, the images are symbols. Each abnormal or different representation takes on a symbolic significance, and I especially like to see the Dog-headed Saint Christopher icons to drive the point home. That is Saint Tekle Haimanot, and yes, that is his leg there next to him on the ground, he stood in prayer for seven consecutive years until its said his leg simply fell off in order to make it easier to continue standing in prayer! This is Saint Gebre Menfes Kidus, who rolled around perpetually with a crew of wild animals including these pairs of big cats. Obviously he was an intimidating presence to the local governors in that in the Grace of God he could speak with and even command the wildest and most dangerous of animals! Of course he was in fact a very kind natured monk-saint who only used his monastic agency (in Ethiopian tradition, recluse monks have the social authority to openly and even rudely criticize secular leaders without punishment whereas commoners would be whipped or even worse for much less an offense) when extremely pressed by notoriously corrupt leaders. These classic Cherub (Kirubel in Ge'ez) can be a bit bewildering in their abundance and repetition, signifying the continuity of the Kingdom and Will of God which the angels fulfill. Saint Abba Aregawi conquering the Serpent before founding the Debre Damo mountain top monastery, I couldn't find an online image of the traditional mural painting like we have in my parish where Abba Aregawi is not wrestling with the serpent, but rather is actually riding it up the mountain like a rope-swing elevator! Kinda drastic so don't click when you are sensitive. ^ They're horrible! 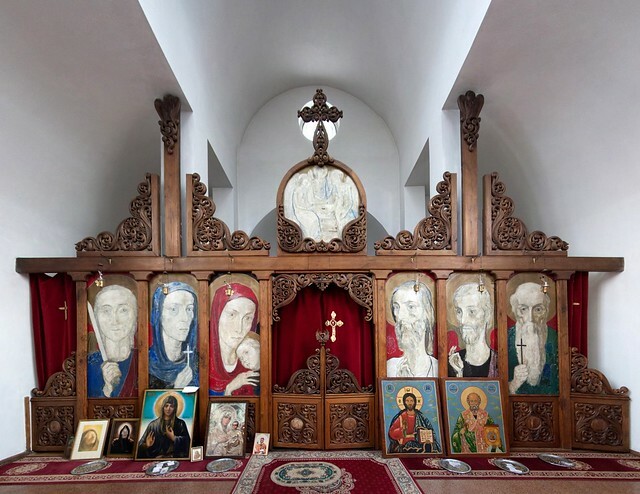 The holy ones on the iconostasis look ghastly, emaciated, ravaged, with a deer-in-the-headlights look in their eyes, bordering on naked terror. Might be OK in a medieval Gothic church, but there is no place for such travesties in an Orthodox church! Whoever painted these images has NO idea of what iconography is. Where is the gravitas, stillness, dignity, reverence and spiritual power that good and proper icons possess and proclaim? What a crying shame that a beautiful iconostasis, made by skilled hands, has been spoiled by these artistic flights of fancy. Shameful. 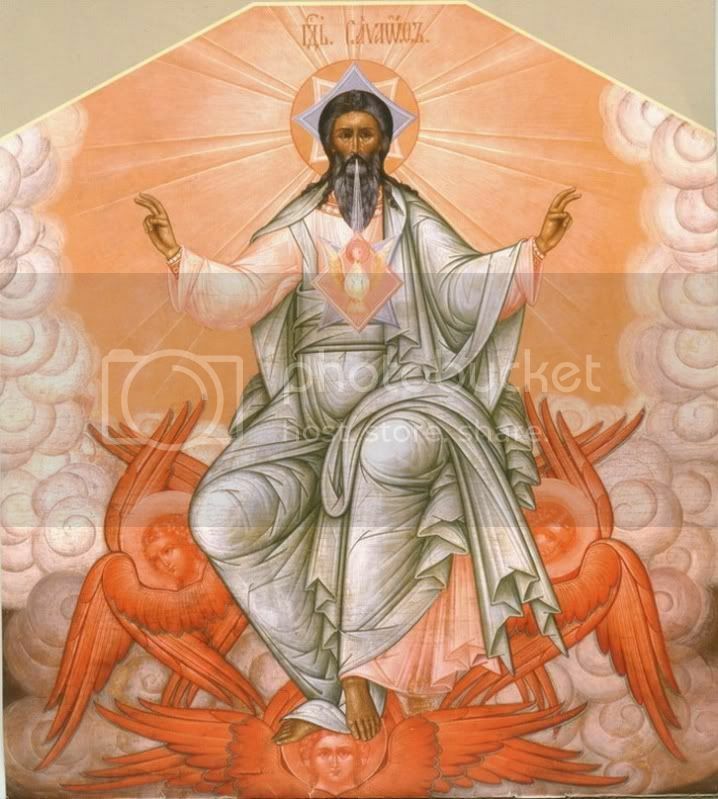 Those from the section titled 'Theological Icons' (pp. 38-41). 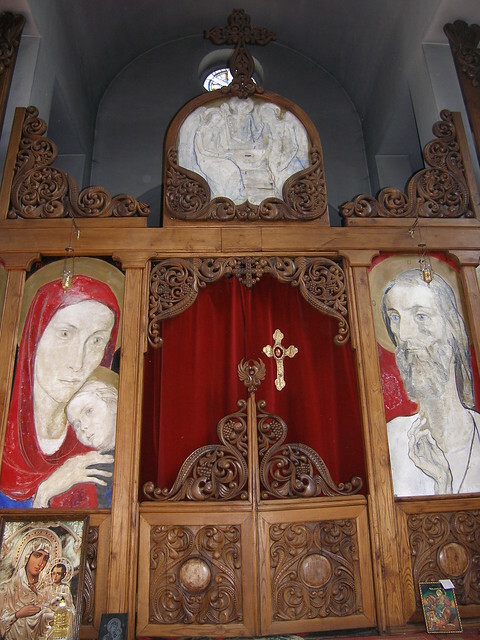 My first thought when I saw the icons on the iconostasis was "Night of the Living Dead". They all look like zombies, absolutely hideous to behold. If icons reflect the spiritual state of the iconographer, this work does not reflect well on the one who panted them. @ag_vn : Where is that? 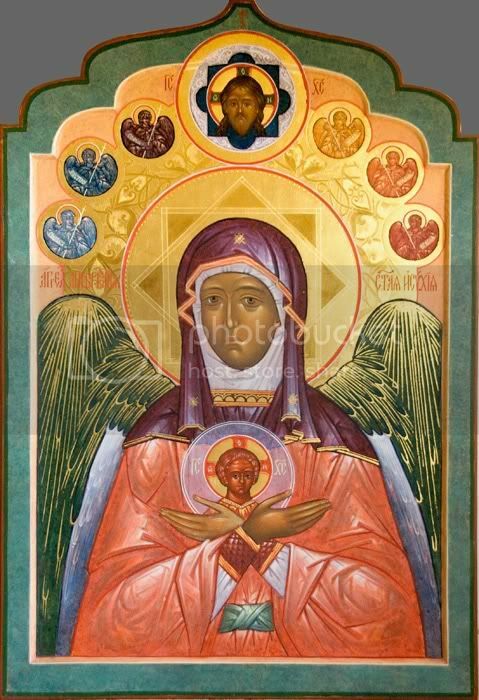 Are you sure that's supposed to be an Orthodox icon? Looks like an alchemical emblem. Oops. Well, it's odd enough. I have never seen an icon like this! They all look like zombies, absolutely hideous to behold. I was thinking about how creepy they looked too. I don't think I could make it through a service there. ok I am very curious , where is this Church ? and how come the icons look like they are taken from somewherelse and posted there ? they did not look like byzantine to me, but are they? 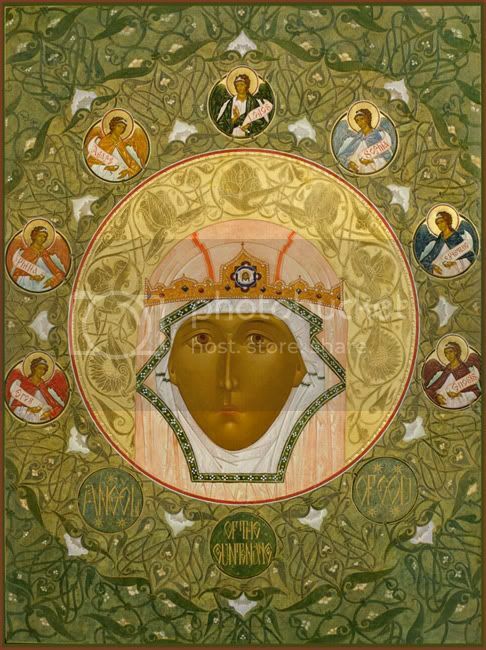 I see on the top the byzantine Trinitarian icon though even that is unusualy gray, but the bottom ones i mean the grey ones they do not look like they are. 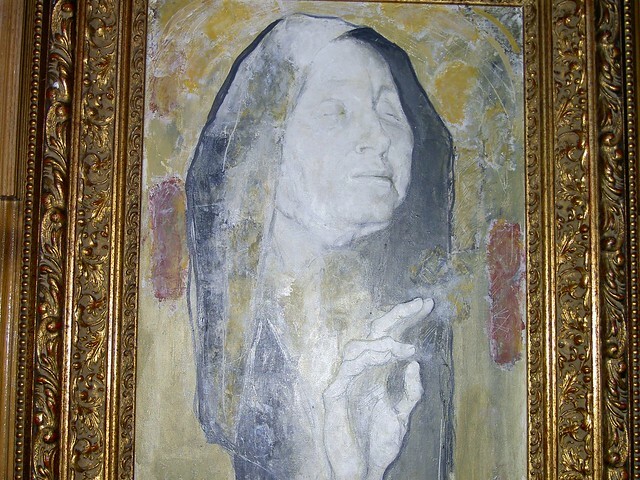 It is "St. Petka" in Bulgaria, built according to the wishes of and to honor a fortune teller and psychic "Baba Vanga". As far as I can tell it's not an Orthodox Church. ok I am very curious , where is this Church ? 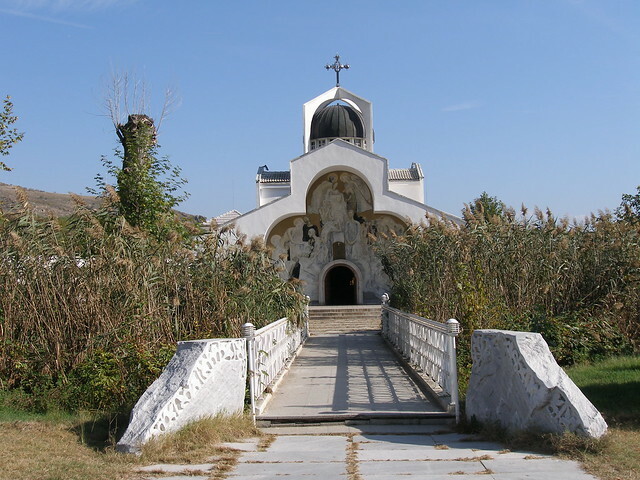 This is the Saint Petka (Petka is Paraskevi in Bulgarian) church in Rupite, Bulgaria. It was built with donations from Vanga. The site was chosen by her. As far as I can tell it's not an Orthodox Church. Well, it is an Orthodox church. It was consecrated by the local Metropolitan, but at the time of consecration these icons weren't there. As far as I know they were put later. 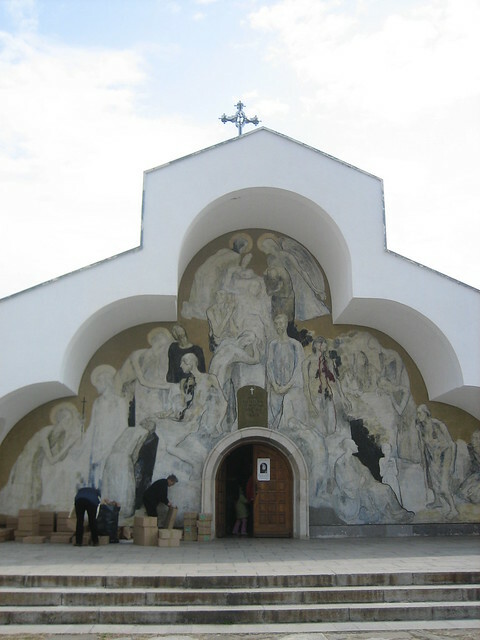 These "icons" were painted by Svetlin Russev (Светлин Русев), a Bulgarian artist, so he is not an iconographer. He was a close friend of Vanga and is considered by many an Occultist. 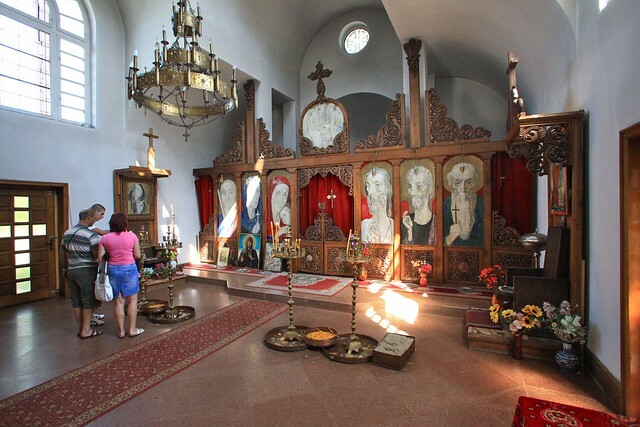 Although a consecrated Orthodox church, for many it is mainly a place for veneration of Vanga. Her followers and fans regard her as a prophetess, while regular Orthodox faithful consider her an Occultist phenomenon or even witch. 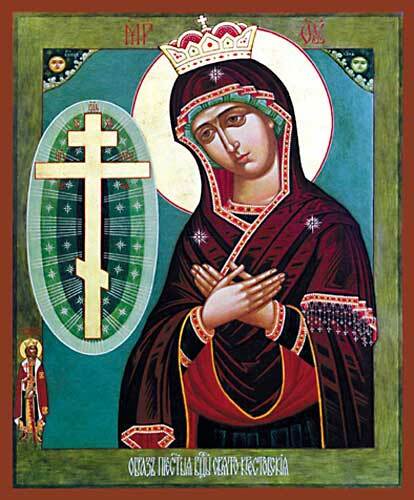 From what I know the existing of these "icons" is a scandalous among the faithful. Ah, all I could find was one website that I had to run through a translator, so the quality was very bad. Thanks for the correction. It seems like there are two bishops' thrones there on either side, which is also strange. ^The one on the left is not exactly a bishop's throne, although it's a smaller throne with a pseudo-icon of Vanga "blessing" the people. I like it. The mantle with so many stars is beautiful. The difference being that Christ is carrying a big cross and spears instead of the angels carrying little ones. 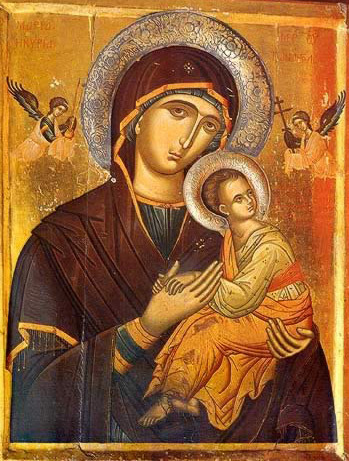 Icon at the Monastery of Gelati. Doesn't Frederica Mathewes-Green use this for the cover to most of her books? If not all, at least for the cover of her famous one: Gnashing Teeth! I bet there is no horsing around at mealtime at that monastery. 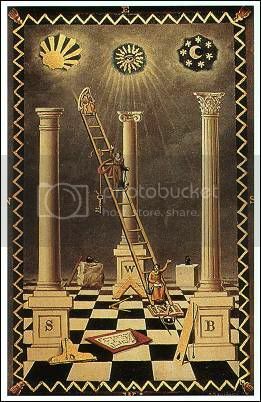 Thank you for the information, the “occultism” certainly does come through in the images. thank you for the information ag_vn, and Joseph Hazen, I appreciate it, it certainly explains why they look so deathly pale, grotesque, and with eyes closed too not orthodox icons at all. Those are the ugliest icons I've ever seen... or hope to see. It's like something out of the Catholic 1970s. I saw this icon in a video once and I could never find the name of it ! Thank you! As a Catholic I agree! 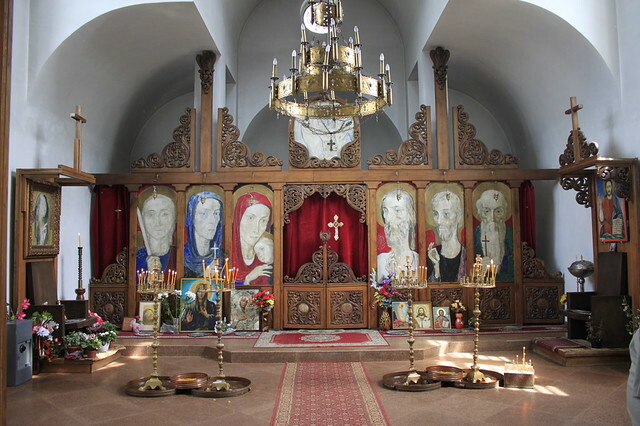 Those icons in that church's iconostasis are the most terrifying things ive ever seen. ever. This work is typical of the western religious art, and devotional practices, which came into various regions of Greece during Venetian rule. I wish I could see the outside of the building better. This looks super occult from a distance. What is it depicting?